Figure 1 represents all search volume on Google for the term "semantic web" from 2004 to present. You can see that the search volume of the Semantic Web was at its peak in 2004 (as far as this graph shows) and has slowed down since. I don't think that this is due to lack of interest in the Semantic Web, rather I think that the Semantic Web movement has been churning at a slow pace for a few years because people have needed to digest what has been developed so far. I see a lot progress being made daily as a direct result of more people getting involved with the Semantic Web. In Figure 2 you can see all search volume on Google for the term "semantic web" for 2007 so far (January 1-August 30). Although Google's graphs do not show any figures, we can see that the popularity of the Semantic Web no longer seems to dip significantly. I believe this is perhaps a sign that the core Semantic Web community has been established and that the popularity of the Semantic Web will soon be seeing a large boost. 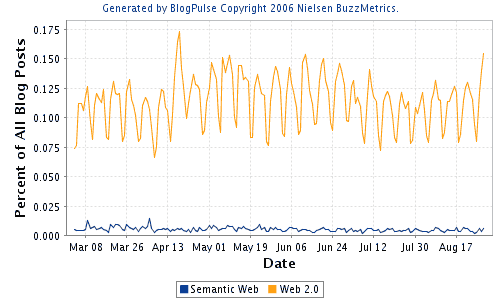 In Figure 3 you can definitely see that Web 2.0 search traffic heavily outranks the Semantic Web's search traffic. This isn't surprising at all, we're in Web 2.0 as it is, and I imagine that Web 2.0 will continue to grow (as will the Semantic Web) until the toppling point when the Semantic Web's components have been securing put into place. Figure 4 reaffirms what I said previously, that Web 2.0's search traffic continues to rise while the Semantic Web is enjoying a peaceful fermentation period in which we see no further drop in search traffic. 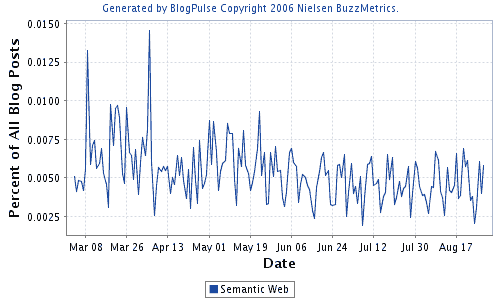 Figure 5 show us the percentage of all blog posts that talked about the Semantic Web within the last 6 months. You can see that on average our blogging volume hangs between 0.0025% and 0.0075% of all blog posts. These are actually figures us Semantic Web bloggers can do something to change. Many Semantic Web blogs do not update as frequently as blogs of other topics because the Semantic Web community is not as vast, and updates to the state of the Semantic Web are probably not occuring every few minutes. Figure 6 suggests to me that there is a correlation between search trends and blog trends. You can see that Web 2.0's blogging volume hangs between 0.075% and 0.150% of all blog posts. If nothing else, we got a good visual idea of what the trends are like right now. I think it's safe to say these figures are going to change a lot in the near future and we shouldn't be surprised when the Semantic Web is ambushed with a resurgence of popularity. To me, the graphs show stages in the Hype Cycle. Web 2.0 is still peaking with new found interest as new avenues are explored while the Semantic Web community happily digests what it learned from its last peak.